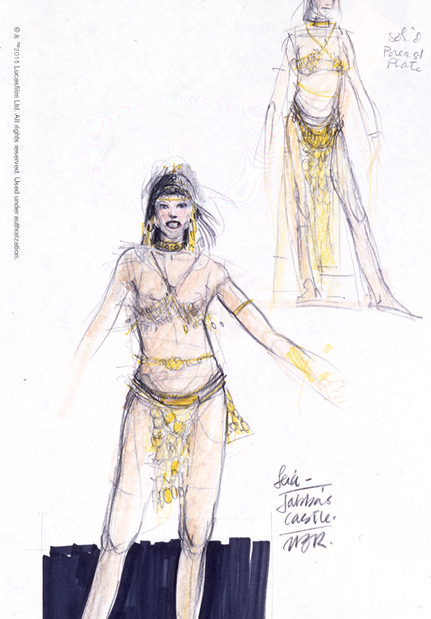 Costume designers Nilo Rodis-Jamero and Aggie Rodgers designed the slave bikini, but struggled with how to dress the normally modest Leia with such boldness. Inspired by fantasy artist Frank Frazetta, they designed a costume in collaboration with sculptor Richard Miller. They created multiple versions of the costume to accommodate different scenes in the film, including a hard metal piece for scenes in which Fisher remained still, and a rubber costume she and stuntwoman Tracy Eddon could wear comfortably while performing stunts. "The moment that the actress Carrie Fisher appears on screen in the slave bikini, something clicks between the character and the audience—you make an immediate judgment that you didn’t make before, and you see a side of her which has not been seen. Up to this point, Leia had been concealed beneath modest white robes, and with this scene, her feminine side is thoroughly revealed. The costume is a type that can be traced to earlier films, such as Myrna Loy’s turn as the native dancing girl in 'The Desert Song' from 1929, Yvonne De Carlo in 'Slave Girl,' 1947, and Maria Montez adventure films from the 1940s. These early vamp characters functioned largely as sexual objects, waiting to be molded by a male character. "With the Leia slave bikini, George Lucas, however, turns the idea of 'object' on its head. Leia is not a character that needs to be molded. She is exposed and temporarily humiliated, but she is in control, plotting her revenge. Ironically, and somewhat brilliantly, the vehicle for her revenge is the costume itself—she uses her own chains to strangle her monstrous captor."